To celebrate its 20th anniversary, Eastern Creek International Karting Raceway will change its name to Sydney Premier Karting Park and will have Australia’s first indoor motocross park built at the facility. The $5 million motocross park will also bring with it upgraded roads into the facility. “Changing our name to Sydney Premier Karting Park will celebrate the 20th anniversary of the karting facility and represents the shifting tide of Sydney’s population, which is migrating toward the City of Blacktown on a daily basis,” said Sydney Premier Karting Park Founder and Managing Director, Garry Holt. “The plan for the Sydney Indoor MotoX Park is extremely exciting and something that I am sure will be embraced by motorcyclists from the Central Coast through to the Blue Mountains and beyond. The motocross park is being housed in an air-filled membrane constructed in the United States and being shipped to Australia. It will feature three tracks inside the dome that will operate independently, have full medical facilities and trained staff on site and a cafe and retail area. There will be seating for up to 6000 spectators also. Sydney Indoor MotoX Park has full backing from NSW Department of Sport and Recreation and Blacktown City Council. It will operate from 9am to 9pm each day in line with the hire kart facility. 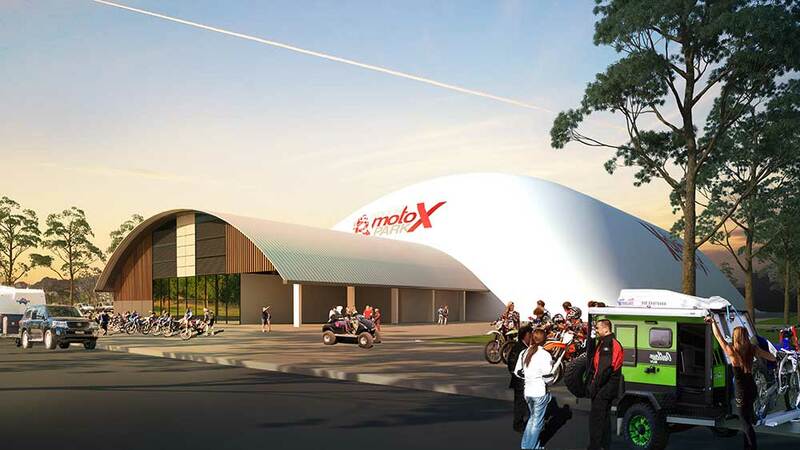 “The addition of Sydney Indoor MotoX Park is something completely new to Australia – let alone our city,” said Mayor of Blacktown City Council, Stephen Bali. “It will be a safe, world class and most importantly – legal – facility for recreational dirt motorcyclists to enjoy their sport and compete year round. The motocross park is the brainchild of dirt bike enthusiast, Mattew Bartolo – who is looking forward to providing options for motorcyclists in Sydney – with very few riding legal and safe facilities available in the current environment. “Sydney Indoor MotoX Park will give riders a facility to ride in at any time of day or night and in any weather condition. Riders can bring their bike or hire one of our bikes and full safety equipment on-site. “A rider can finish work, grab their bike and within 15 minutes of where they live, have dinner at our cafe, have a ride and be home by 9pm. Those behind the indoor motocross park endeavour to have it built and operational in line with Sydney Premier Karting Park’s 20th anniversary in December.